I recently stayed at The Metropole Hotel in Llandrindod Wells on business and felt it worth writing something about. I’d definitely like to return! The hotel itself is family-run and has been in the same family ever since its conception in 1896, which these days is something very special! This old Victorian building in the lovely little spa town of Llandrindod Wells has a truly rustic charm with creaking stairs, great grand mirrors and ornately decorated wallpaper and is 4* rated, deservedly so. The rooms were a good size (from my experience), the service was very friendly and accommodating and the food was very good. There’s a spa where we took a lovely dip in the hot tub – could use a lick of paint here or there but the facilities were of a good standard and it fit the bill well for a relaxing swim & soak before dinner. Everything else such as the sauna and showers appear to have been renovated in the last few years; there was also a small gym room, mostly cardio machines but there seemed enough weights for a decent mini session. Primarily, let’s get back to the food. As part of our stay we had a 3 course dinner in the award-winning Radnor Miles Restaurant which is dedicated to using only the freshest organic, local produce – music to my very ears! I’ve spoken before on the importance of using local, fresh ingredients and I love that in Wales we’re in the prime environment to do so. 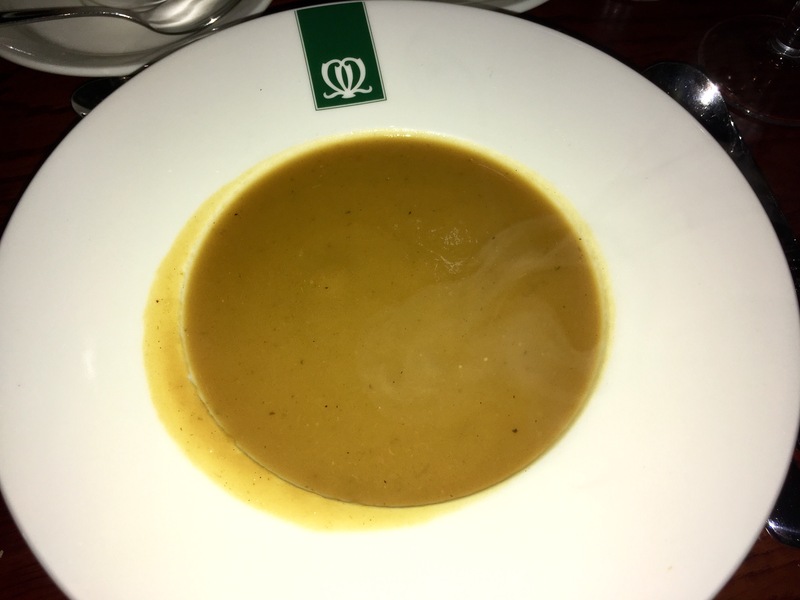 Chef’s Homemade Soup of The Day – which was Sweet Potato. Smooth, refreshing and light yet good, full-bodied flavour (as sometimes I find potato soups can be a little bland); this was the perfect starter to whet the appetite and leave me looking forward to the courses to come. It also went superbly with the accompanying buttered brown roll (or two), but what soup would be complete without a bread roll anyway. Fresh Pasta with Prawns – again very fresh and well seasoned, plus it’s always a bonus for me when the prawns are already shelled as I’m not great at the whole taking its face and legs off thing… However, as lovely as this main was, I slightly regretting choosing something as heavy/large. 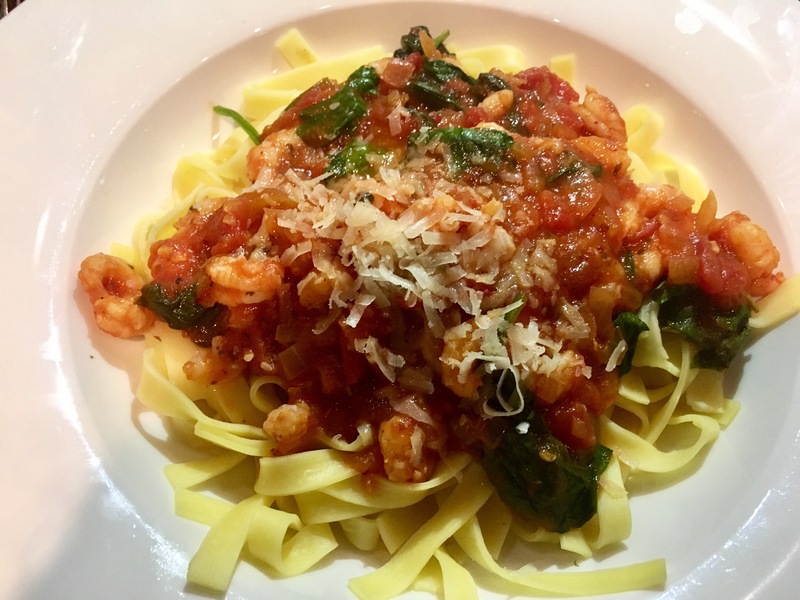 Pasta is easily one of my all time favourite foods and I regularly choose it when eating out, yet it runs the risk of being a little too filling and leaving you struggling to find room for dessert which, if you’ve a sweet tooth like me, is not what you want. Nevertheless, it was a very tasty pasta and had it not been part of a 3-course deal I’d certainly choose it again. 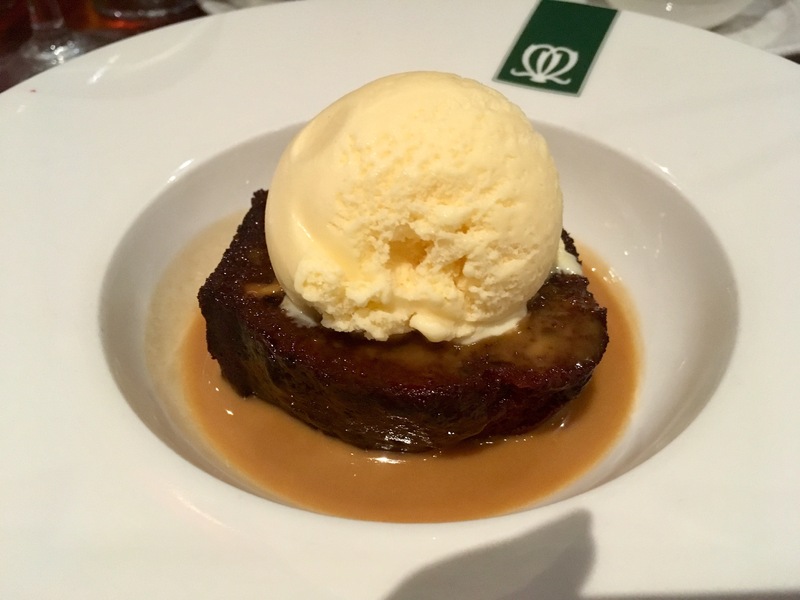 Warm Sticky Toffee Pudding with Butterscotch Sauce (and ice cream) – honestly, it’s rare that I ever choose a dessert that doesn’t involve ice cream. Or, more often than not, I’ll ask for ice cream to be added on as well as I did in this case. Both the dessert and the starter were lovely and warm without being too hot, yet not the kind of warm when you’re worried it may have just been reheated. This was all fresh and fantastic. As a result, the butterscotch sauce ran off the top and around the sides with a delicious viscosity and the ice cream began to soften quickly, just as it all should. It tasted lovely, although could have been a little more moist; myself and two of my colleagues agreed that sadly, it just didn’t quite top the sticky toffee pudding we had at The Hilton bottomless brunch a few months ago. All in all, however, it was a very tasty, good quality, fresh meal produced to a high standard. The service throughout our dinner – and throughout our entire stay – was impeccable and attentive to our every need. The restaurant itself was also an appropriate temperature, something I’ve not mentioned in previous posts but recently came to my attention as a definite influential factor in the enjoyment of a meal and/or experience, especially if you feel the cold like me it can be distracting or even off-putting. Following the meal, we marched back to Spencer’s Bar and Brasserie where I continued to make good use of the gin collection on offer, comprising the Warner Edwards rhubarb gin I’ve become rather fond of, which I was very pleasantly surprised with – a big selling point for my wanting to return next time I’m in Mid-Wales. I’d definitely recommend The Metropole if you’re in the area, it was a very enjoyable stay from start to finish and personally it ticked all the boxes. Great food, nice spa & gym, comfortable room, bath, well-stocked bar (although this is likely because there’s not much else in Llandrindod Wells) and very helpful, highly professional staff. The only criticism I did have was there seemed a distinct lack of power sockets in my room, but you can’t have everything and sometimes it’s nice to unplug! Have you stayed here before? What did you think? Let me know in the comments or on social media! Sort yourself out this Saturday night with Street Food @ Depot! It’s Saturday, it’s been a long week and you really fancy a good night with good food, beer and friends. This is the place to go: street food socials have started up at Depot as of last week with a range of differing pop ups each week throughout 2017 – so there’s no reason not to go see for yourself! There’s funky fairy lights and jazzy decorations all over, the usual Depot wooden tree shining proudly in the centre. There’s also a funky little caravan at the back with a super cool inside and a bench for chilling on, whilst bean bags and deckchairs near the entrance allow you to relax and pretend you’re on a paradise beach – although really, you could call food festivals a kind of paradise in my opinion. I’ve said this many times before (and my flatmates know only too well) but I believe fairy lights to be so special for the warm, fuzzy, cosy feeling they instantly bring to any setting, especially when coloured paper lanterns are also involved as is the case here. There’s just something magical about them that brings a lovely atmosphere to a place, trust me. Next on the menu: a ‘Flawsome Taco’ from The Bearded Taco. This delectable little package was composed of Middle Eastern falafel with hummus, tabbouleh, tzaziki and fresh parsley. As there was a 2 for £6 deal, I shared this order with my flatmate (1 taco each) who prior to this had sampled the new and already legendary Donald Trump burger from Got Beef (featured right) – Chinese leaf, bacon, Russian dressing, Mexican nacho cheese sauce and topped with a tiny pickle… Brilliant. It tasted good too apparently, although the cheese was pretty messy. Anyway, the other taco we chose in this deal was ‘Rage Against the Tagine’ (also brilliantly named) consisting of a Moroccan chicken & stone fruit tagine, a carrot, almond & chickpea slaw, harissa yoghurt and fresh coriander. We can’t fault either of them, both went down an absolute treat and hit the spot perfectly! Very well balanced, well portioned, the right proportion of salad/slaw to meat/falafel and altogether a gorgeous little mouthful. The chicken was very tender in the best possible way, I’m told. I’d seen The Bearded Taco back in the summer at Street Food Circus but hadn’t had chance to try them until now (I was waiting for there to be a veggie option to choose from) and I will certainly be going back for more next time. Me loving my street food as always! Every menu at street food social was very tempting and looked delicious and, as I said, there are different pop ups week-to-week so I’d 100% recommend getting yourself down there for a look one weekend. Keep an eye on the Depot Instagram for the latest updates! If you want really good, local, honest food with a great atmosphere and a decent selection of drinks to match, this is the place to spend your Saturday evening! Dash to The Hashery for some great new grub! I’m back on the blog! Sorry to any of you who’ve been waiting to hear from me over the past month; as you can imagine it’s been a very busy time of year especially as I’ve just moved house! But finally finding the time to sit down and write again, so here goes. There have been many food adventures since my last post but this one in particular I felt I had to share with you all: The Hashery is brand spanking new in the centre of Cardiff and offers a range of Cubanos, cocktails and mussels as specialty – may sound like a strange combo but trust me, it’s heaven. My mother and I went only two days after its opening and were treated so well that we already plan to go back again. It’s a large space but not cold if you head towards the back, whilst the combination of the dimmed edgy lighting that seems to be so in vogue at the moment and the warm friendly faces of the staff greeting you as you walk in really make it feel welcoming. First port of call: cocktails. What could be better at lunchtime on a Sunday? ‘Electric Tea’ tasted exactly how it sounds; zingy, fresh, exciting, familiar but with a twist. Containing a mixture of rum, tequila, vodka, gin, triple sec and blue curacao no wonder this cheeky cocktail gave us a warm glowing buzz before we tucked into the mains – we loved it! At this point, it’s also very important to mention that cocktails are two-for-one all day, every day and for only £6.95… absolute dream. Now I must admit; I am not a person who shares food. But I do, however, love going out for a meal with people who like the same sorts of things as me so that we can try a little of each others’ but still enjoy 98% of our own dishes (or rather, I eat my own 98% and then wait until they’re full so I can ‘help them out’ – because we hate wasting food don’t we). For this reason, among many others, my mother is one of my favourite dining partners, 9 times out of 10 ordering the other thing on the menu I really fancied trying just so I can finish it later. On this occasion it was the Mexicano Cubano: avocado, tomato, grated triple cheese, Monterey Jack cheese and the bacon left out for my benefit. I went for the Citron Mussel Pot with an orange, ginger, carrot and coriander sauce ‘with an Eastern twist’ and I can safely say that these were the best mussels my 22 years thus far on this Earth have given me. They were divine. And from local, sustainable sources making them all the more tasty and satisfying. I really can’t recommend them enough! Soft but not overdone, not a single shell unopened, super filling but incredible sauce that I tore up my bread into as many tiny pieces as possible to enjoy, it was just wonderful. I can’t wait to try some of the other flavours! And starting from just £7.95 per mussel pot it’s an absolute bargain. They’ve also just been named as one of the top things for foodies in Cardiff to try in 2017, so I’m certainly not alone in this opinion (see Wales Online’s article). Going back to the Mexicano Cubano; this was also truly scrumptious. Sometimes with really cheesy grilled sandwiches it can all get a bit too much and fill you up too quickly but the balance was just right on this one, so much so that I had to fight my mother for that precious 2% of her meal. Plus, let’s not forget that the avocado makes it feel healthy and contrasts really nicely with the tomato so everybody’s a winner here – I can only imagine that for meat-eaters the bacon would be the icing on the cake. We also shared some courgette fries which were different and interesting; you’d think they’d be a bit soggy but the batter was done really well just like sweet potato fries, we very much enjoyed. Altogether a solid 8/10, maybe even pushing it to a 9 just for those mussels! But I’d like another few visits to fully make up my mind. I highly recommend The Hashery as part of Cardiff’s ever-growing foodie culture which I am super excited about and to be a part of. This place has a diverse and different menu which brings a fresh taste to Cardiff’s city centre in the form of amazing local seafood, whilst also being in a convenient location whether you’re out for the evening or just looking for a great sit-down lunch during a busy day’s shopping. Founders Sean Hill and Oscar Garcia have really hit the nail on the head with this one. A brilliant meal with perfectly balanced drinks and great customer service, all at a very reasonable price, we couldn’t have been happier. Their casual name drop in this Wales Online article about things to look out for in 2017 is also kind of a big deal! So go on, dash to The Hashery and see what you think. I promise you won’t be disappointed; I can’t wait to go back.